Hand In Hand: Never Ever Ever #9 and a Giveaway! 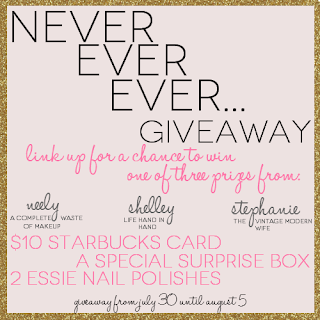 Never Ever Ever #9 and a Giveaway! Can I keep up with reading every single post of everybody's blog that I follow. Life gets busy and the blog posts pile up so then I just have to read what I can and comment on those. Will I be able to blog every day. Or will I want to, haha! Will I pay to sponsor again. It's just not worth it to me. I'm also going to be getting ride of my sponsoring spots too since Passion Fruit Ads is going to charge $9 a month. Maybe if I made enough from it to make it worth it but nope! I've been giving our spots for free so it doesn't make sense to pay for it myself. Do I get tired of shopping! I got to go shopping for my birthday (Michaels gift to me) and I just got more money and gift cards so I get to go again! Woohoo! I love to go by myself and take my time perusing. We would like to thank you for participating in our weekly linkup of Never Ever Ever by giving away some awesomely random things! Be sure to participate this week in the linkup to be eligible to win!! One gift from me, one from Neely, and one from Stephanie! wait say whaa? We're gonna have to pay for bloglovin?! I probably won't be sponsoring again either. I mean what is the point. I really don't get any page views from the ones I've paid for (very few), and when I do a giveaway, most people unfollow after the giveaway is over. I do love swapping buttons though. I usually get more from those than anything. Did you mean Passion Fruit Ads instead of bloglovin? I had a Passion Fruits Ads widget on my page because I wanted to swap out ads to then I read about the charging $9 a month... and while I understand that it works for bigger blogs, small blogs like mine are just not worth having that right now! I've been contemplating on purchasing some ads from other blogs but I get worried if I am just wasting my money... I guess it would benefit you if another blog had tons of traffic but it seems like those blogs charge a ridiculous amount of money! I'm talking $60+! That is just ridiculous to me and no matter how "big" my blog gets, I refuse to ever charge a person that much money for a spot!